The Sentinel published a report on 22 April 2012 on the findings and recommendations of the 2010 annual report of the Assam State Police Accountability Commission. The Bengali version of the report as published in the 23 April 2012 issue of the Dainik Prantojyoti can be seen here. 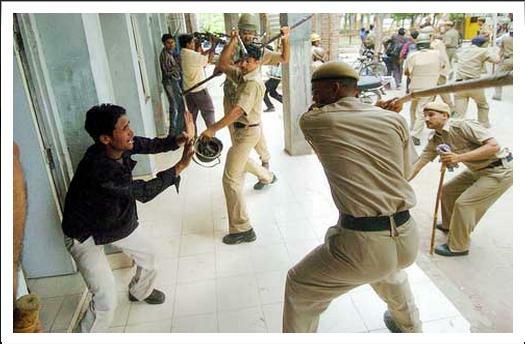 Will policing in Assam ever have a ‘‘humane face’’ in the real sense of the terms? When will the police really begin to behave as a service in a democracy, and not as a brutal, colonial-type force as it acts in many cases? When will ordinary citizens really feel they are being served by the police? These are inconvenient questions, but the police in a democracy must face them and evolve as a people-friendly force. The issue of policing in Assam has become a much-talked-about subject these days. Chief Minister Tarun Gogoi had, on April 16, at the Chief Ministers’ Conference on Internal Security in New Delhi, laid stress on ‘‘policing with a human face’’ in the State, which has seen militancy-related violence ebbing in recent times. The State Police Accountability Commission, in its annual report for 2010, has also given thrust on ‘‘democratic policing’’. The annual report of the Accountability Commission prepared by Justice (retd) DN Chowdhury, who is also the chairman of the Commission, states that ‘‘democratic policing is used to describe the characteristics of policing in a democratic State where police serve the people of the country, not a regime’’. The report has revealed that the State’s police force is ‘‘yet to change its attitude towards democratic policing’’ and ‘‘if the police is to achieve its legitimacy and lawfulness, it must seriously endeavour to become accountable to law’’. Regarding the lodging of First Information Report (FIR) at police station, the report states that FIR is not registered at the first instance concerning issues relating to breach of trust, misappropriation of properties, and other issues. “Sometimes even if the FIR is registered, though belatedly, investigation does not take its due course with end result that the registration of the case becomes a mere formality to escape from the charge of serious misconduct,” adds the report. On the issue of ‘‘general diary’’ maintained by the police, the report points finger at the Assam Police Act 2007 that has not been amended in order to make the general diary a legal instrument with its transparency at the level of thana/outpost activities, which is overdue. “The scope of enhancing police accountability is very wide in the general diary to be maintained having the force compatible with that of the RTI Act,” states the report. “The general diary in respect of information of non-cog nature under the provision of CrPC 155 is one of the important indices of police performance at Thana/Outpost level. The Commission has observed that many of the complaints received by the Commission relate to non-registration of cases and refusal in the guise of non-cog to police. Hardly the police action is supported by the initial records as may be required under the provision of CrPC 155 to find mention in the general diary with advice to the complainant to approach the nearest judicial magistrate for ordering investigation of the non-cog cases by police,” states the report. The report has also emphasized computerization as a strongest tool for transparency and accountability of the police to the law. “It is needless to emphasize that the right of the citizens will be better addressed by receiving FIR in the computer through networking having access to the general public,” adds the report. Regarding supervision of cases registered against cops, the report states that such cases are invariably to be supervised and the cases should be dealt with newer provision in the ‘‘rule book’’ to be amended on a greater priority putting them even as special report cases. “The government should take suitable action in this regard and direct the Director General ofPolice,Assamto initiate proposal to the government accordingly,” says the report. “In our earlier reports we also mentioned that the directives of the Commission for indicating the erring police personnel accountable were not taken in right spirit. Instead instances were found for out-manoeuvring our guidelines and directives. Setting up of the District Accountability Authority and the appropriate steps for creating awareness among the public are some of the issues which need to be addressed for effective functioning of the Accountability Commission and for greater benefit of the people,” says Justice DN Chowdhury in his report. Source: http://www.sentinelassam.com/mainnews/story.php?sec=1&subsec=0&id=114551&dtP=2012-04-22&ppr=1#114551 accessed on 22 April 2012. This entry was posted on April 22, 2012 at 11:30 am and is filed under Documents, News, Press Releases, Report, Resources. You can follow any responses to this entry through the RSS 2.0 feed. Both comments and pings are currently closed.